Note: All photographs and articles are from the collection of Jonathan Siedel who gave his permission to include them with this project. Photo, Frank Siedel with stacks of scripts - note the film reel stacks behind him! News Bulletin of the Ohio Chamber of Commerce, May 1948, reporting on the Ohio Night Dinner held in Washington DC honoring Ohio's distinguished citizens. Frank and Alyce Siedel are pictured at the Ohio Night Dinner. 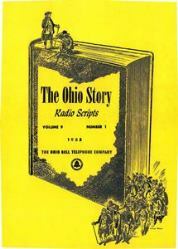 A special script of The Ohio Story was a featured event at the dinner. Frank Siedel posing for the photographer. Ohio Story receives the Governor's Award from Governor Frank J. Lausche in 1948. Shooting an Ohio Story episode during the television days. The Ohio Story display case at WBNS-TV, Channel 10, Columbus, Ohio. Photo, Narrating one of the many television episodes of the Ohio Story. Photograph for a story on Ohio Swiss Cheese "for Congress"! Letter, 30 Oct 1956, soliciting Clevelander Bob Hope for a story - he didn't comply! Cleveland Plain Dealer, 28 Oct 1956, What Makes the Ohio Story?